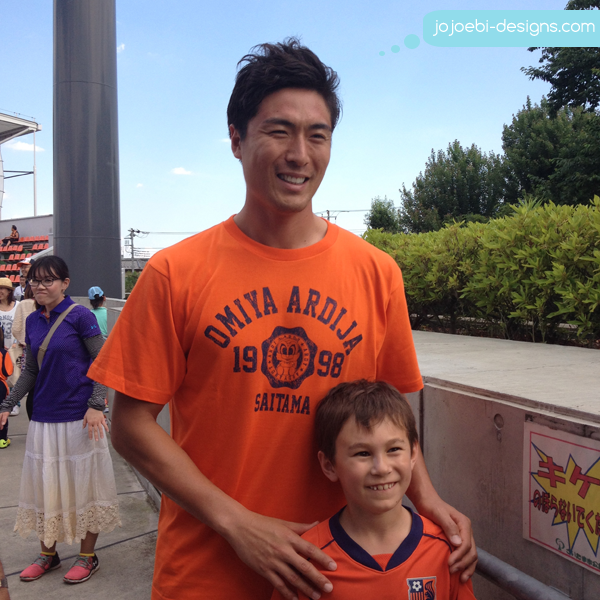 Saturday was Omiya Ardija's family fun day so Ebi-kun and daddy had planned to go along and I was going to take some well deserved me time BUT Ebi-kun the won a spot to play with some of the Omiya team players, he was super excited so of course I couldn't not go! It goes in a lottery so it's a matter of luck to get a place. We met up with some friends and were having a walk around when the Goalie, Kitano walked past, he did a double take at Ebi-kun and said "ohesashiburi" (long time no see)! He remembered Ebi-Kun from last year and we managed to get a cheeky photo even though they had a no photos rule! Of course Ebi-kun was made up! Then we went to check out what was happening on the pitch, they had 'blind football' where you have to wear a mask and try and score a goal using a ball with a bell inside. And there were other events going on for kids of all ages. 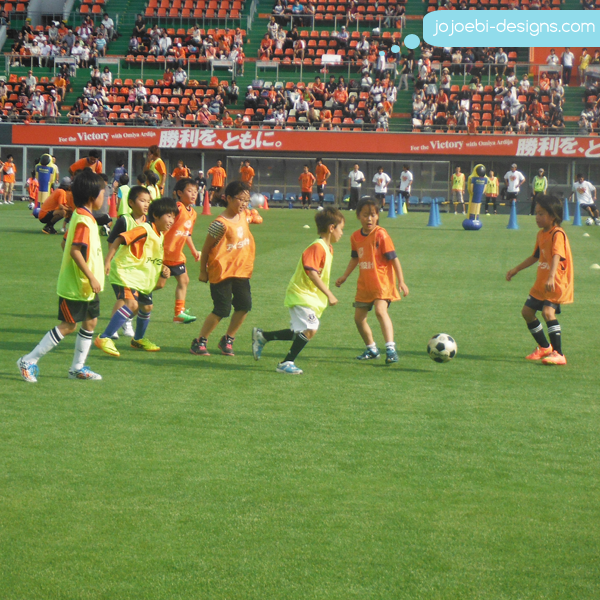 Then it was time for Ebi-kun to make his appearance, they had 15 kids, all 3rd and 4th graders and split them into 3 teams. Then they had a pro player on each team. Girls and boys playing together too. The kids all looked as if they were having fun and the pro players were great. 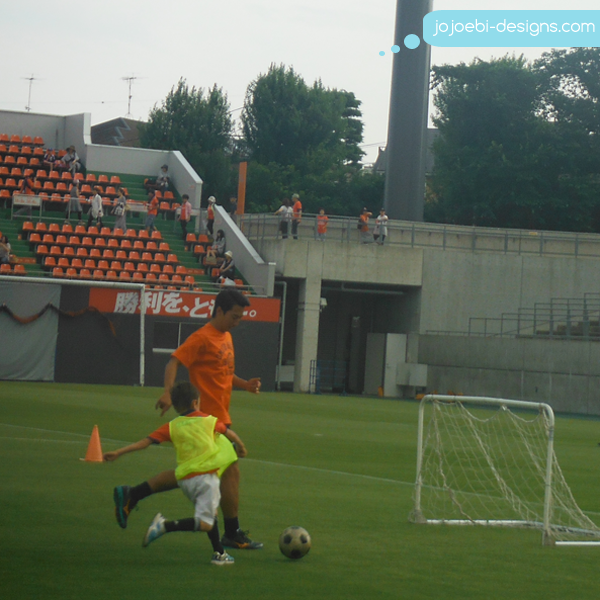 And here's Ebi-kun, taking it down the pitch, gets it past Shin Kanazawa and…. I'm not sure if these fun days are done back home, hard to imagine it happening but a great afternoon, the kids were absolutely loving it. When Ebi-kun was waiting for his turn I spotted one of the foreign players, so I went and asked for his autograph but had to get him to sign the back page of my novel because I hadn't got anything else to write on! Ebi-kun then managed to get a couple more, including Kitano the goalie so he was chuffed to bits and he can't wait to write about the day in his journal!